The Chinese manufacturer ZTE has launched with the a new LTE router MF283 on the market, which supports LTE Category 4 and allows speeds of up to 150 MBit/s in the downlink and up to 50 Mbit/s in the uplink. Terminals could be connected with ZTE MF283 either through wired LAN interfaces or wirelessly via WLAN. The router not only provides a fast Internet connection, you can also make calls over the device thanks to Voice over IP, provided that the provider allows. 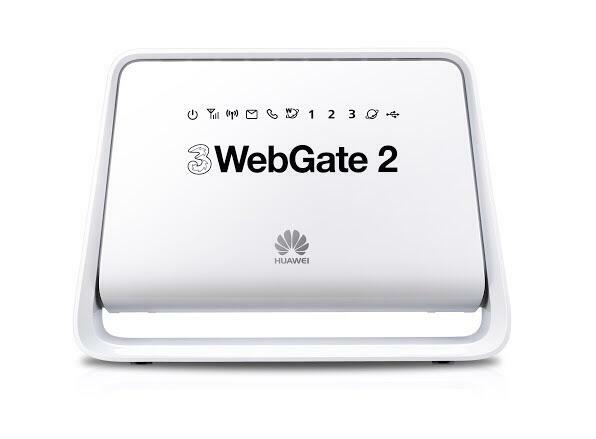 In Austria, the router is marketed as “Webgate 3“. The ZTE MF283 dominated all three mobile technologies currently used in Germany: GSM, UMTS and LTE. In the UMTS network the data accelerator DC-HSPA+ is supported, so depending on your plan and network utilization up to 42.2 Mbit/s in the downlink and 5.76 Mbit/s can be achieved in the uplink. It is fast when LTE can be used. Based on LTE Category 4, speeds of up to 150 MBit/s in the downlink and 50 Mbit/s in the uplink are possible. The Internet connection is optionally provided via one of the four LAN ports on the back of the ZTE MF283 or wirelessly via WLAN. However, the LAN ports operate with a maximum of 100 Mbit/s, so that the full LTE speed can not be exploited. The Wi-Fi 802.11b/g/n is in the 2.4 GHz frequency band, on other hand, speeds of up to 300 megabits per second are possible, according to ZTE, depending on how far you walk to the terminal from the router. On the back of the ZTE MF283, there are two RJ-11 ports for analog phones, and a DECT interface for connecting wireless phones. The telephone is not made directly on the SIM card, but via VoIP directly via the Internet connection. A corresponding VoIP tariff is of course a prerequisite for using the telephone function. In addition to the four LAN ports and two RJ-11 phone connectors, a USB port can be found on the back of the ZTE MF283. Normally, the USB port is storage devices or printers. On the back you will find two connections for an external antenna. This feature works in areas with weak signals as connection quality and speed can be optimized. The ZTE MF283 is in white color with the Austrian network operator “3” in the form of “3Webgate 3”. If you prefer the unlocked ZTE MF283, you can check the site www.4gltemall.com for more details.